HEIRLOOM. An older, smaller variety of the Connecticut Field pumpkin. Small Sugar is even better for pies than its larger cousin Connecticut Field pumpkin. When Mr. Burpee offered it in 1887 he said: "A very prolific and handsome little pumpkin; usual size about 10" in diameter; skin is a deep orange-yellow. It is very fine-grained, sweet and sugary, and keeps well." These fun vegetables are easy to grow in any home garden. For pies and fall decorations every home garden should grow some. Sow in fertile, warm soil after danger of frost has passed. 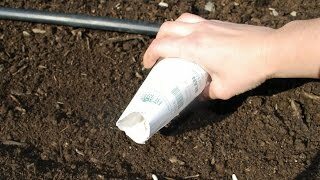 Sow seeds directly in the garden. Give large-fruited pumpkins plenty of room to ramble. For improved drainage sow in mounds, or hills, of soil 12 inches in diameter, 6-8 inches tall. Sow 4-6 seeds in groups about 3 inches apart. Each group should be about 4-6 feet apart. Cover with 1 inch of fine soil and firm lightly. Seedlings emerge in 7-14 days. Do not plant pumpkins and other squash family crops in the same spot 2 years in a row. Pumpkins have both male and female flowers on the same plant. Male flowers will open first and the female flowers will open later. The female flower has a miniature fruit behind the blossom. Do not move or step on vines as they are quite fragile. If you are trying to grow extra-large pumpkins, allow only one fruit per plant to mature. Beds of vigorous, sprawling pumpkin vines can be bordered by corn, towering pole beans, sunflowers and other trellised or vine vegetables. Pumpkins are ready to harvest when the rinds are hard and a rich shade of orange or white depending on the variety. If a light frost kills the vines, the pumpkins are ready to harvest. Pumpkins are damaged by heavy frost. Cut pumpkins from the vine with a pruning shears, leaving about 3 inches of stem attached. Allow the pumpkins to cure in the sun for a week to harden skin. 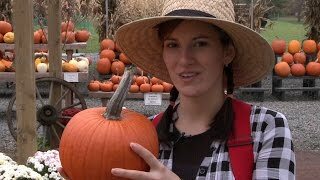 Store pumpkins in a cool dry place. Roast the seeds for a tasty snack. Pumpkin, Small Sugar is rated 5.0 out of 5 by 6. Rated 5 out of 5 by BargainHunter from Cute and tasty! This was the first year I grew my own pumpkins since I typically buy sugar pumpkins from a farm and then freeze cooked pumpkin to use throughout the year. This was MUCH more cost effective and they are so cute growing in the yard. I trellised these up an arbor and they did great, no need for extra support (nets) around each pumpkin. I had two that were ready a week ago but the rest are still growing (early September). I did get some powdery mildew starting on these, but a mix of milk and water sprayed at dusk every few days took care it spreading. Rated 5 out of 5 by Mrscoffield from Great Little Pumpkin My kids and I really enjoy planting pumpkins. We've planted seeds from several different kinds of pumpkins but these were our first heirlooms. I tend to avoid heirlooms because I've had issues with pests in the past, not so with these pumpkins. We got about 1 to 2 pumpkins per vine and they had a good germination rate. I had pumpkins ripe by the end of August. We haven't eaten them yet but they are nice solid little pumpkins. My kids only disappointment was that these pumpkins weren't enormous like some of the 50 lb pumpkins we've grown in past year. Next year I will probably plant both kinds. Rated 5 out of 5 by CaitlinsCrops from Heirloom Pumpkin Patch I planted these seeds about a month ago and they are already starting to vine out. Very fast germination, in average soil, full sun, about 3-6 days. I also am impressed with how strong the little seedlings started out, every single seed germinated. I'll re-post with the quality of the pumpkins in a few months. Rated 5 out of 5 by SalemCat from Easy to germinate After fretting and fighting to get some other Vegetables to sprout, these were a real treat ! 80% or better germinated very quickly into strong young seedlings. I started them in Coir Pots, then transplanted them into a Raised Garden. Will they produce fine Pumpkins ? I have yet to see, but have high hopes. Rated 5 out of 5 by BKBK from Nice pumpkin You can't go wrong with these sweet pumpkins. I have grown these every year since 2007 (saved seeds year after year). Rated 5 out of 5 by Jessica from Wonderful baking pumpkin I gave many of the little pumpkins away, and all four were very happy with them. Easy to clean, no strings and after baking they were effortless to mash.